Is Now the Best Time to Buy Caterpillar Inc. Stock? 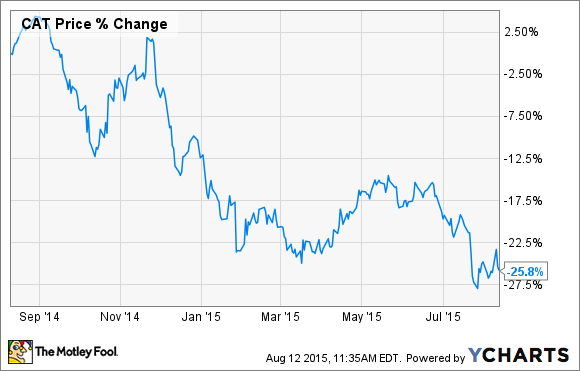 Should value investors consider Caterpillar stock's 25% fall an opportunity? Caterpillar (NYSE:CAT) has fallen out of favor with the market: The stock has given up a quarter of its value over the past year, and is down nearly 16% year to date. Risk-averse investors are still wary of the challenges that the heavy-machinery manufacturer faces in each of its three business -- resource industries (or mining equipment), construction industries, and energy and transportation. On the other hand, value investors are hoping to see the stock bottom out, giving them an opportunity to place a long-term bet. So is this the right time to buy Caterpillar stock? The slideshow below will give you my answer. Take a look.